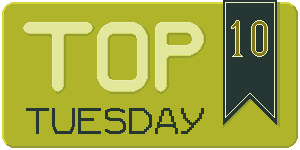 Top Ten Tuesday is a feature/weekly meme created by The Broke and the Bookish. Each week I will post a new top ten list to answer. Everyone is welcome to join in. I do not have a Christmas tree however, but it is still nice to imagine there would be presents on the floor next Saturday. This entry was posted in Top Ten Tuesdays and tagged Adventure, Cassandra Clare, Christian McKay Heidicker, Contemporary, Drama, Erin Summerill, Fantasy, Kendare Blake, Lauren DeStefano, Leigh Bardugo, Marissa Meyer, Romance, Sara Raasch, Sarah Porter, Stephanie Garber, Top Ten Tuesdays. Bookmark the permalink.